"Blind Justice" - Part 3: "Consumed"
As Superman battles with Frankenstein the Wrath tries to convince Lee that she is not like the monsters fighting before them. Lee was not a monster to begin with like Superman. This is why Wrath wants to bomb Houston with her Black Mass; to create more heroes like Lee. Lee disagrees and makes a run for it but is taken down by Wrath's robots. Clark is able to defeat Frankenstein but is confronted by Wrath who explains that once she was a normal woman who rose through the ranks of the DA's office and became the Mayor of Metropolis. Superman and his kind changed things for the city and Wrath knew there had to be a better way. Enter Vandal Savage, who showed her how humans could save themselves. His gift was something that turned her righteous anger into power and now there is no need of Superman. Clark merges with the shadows and uses the power to take out one of the two bombers heading to Houston. The Wrath attacks and shows him how the people in his life and the people he has recently saved are afraid of him. Superman ducks into the shadows and emerges once again in front of Frankenstein. He realizes his best hope is to absorb all of the shadows, including those infecting Lee, into himself. Superman uses the shadows to prevent the Black Mass from detonating over Houston. Vandal Savage appears before Wrath and takes all of the shadows back. He leaves saying that only he can save the world. Lee finds Superman and tells him that all of the shadows are gone. Superman talks about all of the power he just had and while Lee believes that he could have handled it she likes her Superman just the way he is. Story - 3: This issue was not at as boring as the previous one. I still didn't care for it but I enjoyed it more than the last one. I think my main problem is that stories where the antagonist uses something to bring out the bad side of the protagonist, especially if that something is magical in nature, are kind of lazy from a story standpoint. Yes, it explores the darkness we all have in us and what better character to put through that than Superman? The problem is that because there is an outside, magical force bringing this out in Superman we're not really seeing him deal with his darker urges. Essentially he is acting the way he is acting because he was, for lack of a better term, drugged. This isn't Clark being tempted and willingly giving in, which is a much better way to deal with that sort of story. He's infected with shadows and while he wins in the end it's not that much of a victory. This leads to my second problem with the issue. Vandal Savage. His presence was hinted at a few months ago but having him pop up at the end of this and take the shadows away and then take credit for saving the day is a bit of a cheat. First, the meeting from the end of the issue a few months back is hardly the kind of set up this sort of plot device deserves. I wanted a bit more of Wrath and Savage interacting. Second, even though Clark used the shadows to stop the bomb we'll never know what his ultimate decision would be. Savage took that away from him. He "saved the day". While Savage's involvement does hint at a larger threat it just doesn't feel earned. On one hand I am glad that there seems to be an endgame for everything that's been happening to Clark but on the other hand Pak and Kuder set up Wrath as the big bad and she's not even taken out by Superman. It's a messy story that doesn't seem to have much thought behind it. I could be wrong but that's how I feel. This title has taken a serious hit in terms of quality over the past few months. The stories haven't been grabbing me and there doesn't seem to be much of a point to them. If all of this is leading to a confrontation with a larger threat, then the creators have done a poor job of getting us to that point. Nothing the creators have done is better than what came before the de-powered Superman idea started. We have gotten action but there's no heart behind it. If Pak and Kuder had managed to excite me for more than a month, then maybe I'd be more on board. As it is I am getting nothing from this title and going through it has become a chore. I sincerely hope this changes soon. Art - 4: As usual the art is the highlight of the book. I have liked Georges Jeanty's art for years and he doesn't disappoint. The action was dynamic and the flashbacks looked great. The fact that there were so many inkers and yet the transitions never felt jarring was also nice. I write this nearly every month but once again while the story is letting me down the art is making it easier to get through. Cover Art - 2: This is another boring cover. 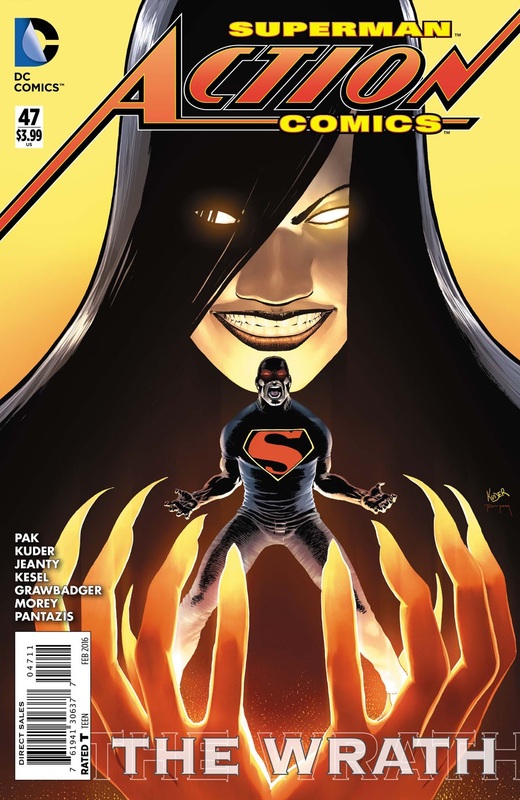 There is nothing sinister about Wrath and an angry red eyes of anger Superman is beyond clich�d at this point. There is nothing appealing about this art.